The U.S. dollar traded higher against most of the major currencies today ahead of Wednesday's Federal Reserve announcement but the greenback's gains moderated towards the end of the NY trading session. What's surprising about the move is that it comes despite signs of tax reform deal. There was talk that a tentative tax deal could come today and while Senator Cornyn, the No. 2 Senate Republican said they don't have a deal this minute but are getting closer, there's a very good chance that a deal will be done by Christmas. The dollar retreated slightly when Republican Senator Rand Paul suggested that he would not support the bill but the GOP can afford 2 defections and at the end of the day, he'll probably be swayed. Looking ahead, the Federal Reserve is widely expected to raise interest rates for the last time this year. This will also be Janet Yellen's final move before she hands over the baton to Jerome Powell the first week of February. Fed fund futures are currently pricing in a 98% chance of a hike and given that investors have fully discounted the move, the real focus will be on guidance. Yellen doesn't have any particular reason to provide specific guidance on future policy as she won't be the one following through with the next move but Powell is currently a member of the Federal Reserve board and his views on policy could shape the FOMC statement and affect Yellen's outlook. Keep an eye on the dot plot because at the last meeting, the median member expected rates to settle around 2.75% over the longer term, which was lower than the previous 3% forecast. We know the Fed plans to raise interest rates 2 possibly 3 times next year and investors are looking for the first move to be made by June but if the economic projections or Yellen suggests that it could come sooner, we will a dramatic rise in the greenback. USD/JPY could reach 115 and the EUR/USD would fall to 1.16. However if Yellen keeps guidance to a minimum and there are no major changes to the economic forecasts, even if the Fed raises rates the dollar would fall victim to profit taking with USD/JPY sinking back down to 113.00 and EUR/USD rebounding to 1.18. 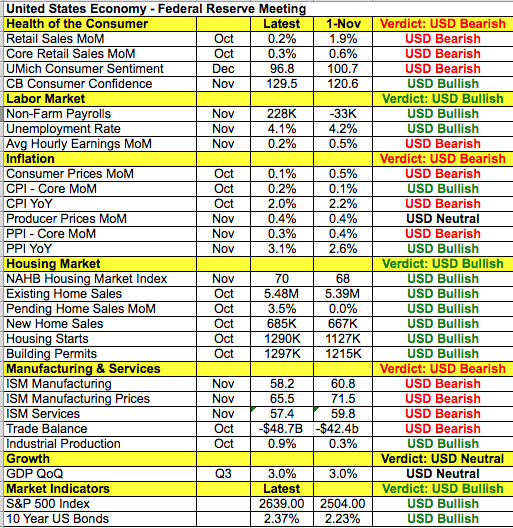 The following table suggests that the Federal Reserve needs to tread cautiously. Tax cuts may be right around the corner but consumer spending remains weak, inflation is low and the latest ISM reports show manufacturing and service sector activity slowing. The labor market is healthy but average hourly earnings growth eased since their last meeting. Housing is the only area where there's universal improvement but changes to the tax bill could drive demand and prices lower. With this in mind, we know that the Fed will be optimistic as they see the economy continuing on its positive course in the year to come. The combination of a rate hike, press conference and economic projections makes this a significant FOMC meeting, but with minimal guidance expected, there could be a narrower than usual reaction in the dollar, which would be ideal for the Fed but disappointing to the market. Both euro and sterling shrugged off their latest economic reports to trade lower against the greenback. EUR/USD dropped below the 50-day SMA in a meaningful enough way to open the door to a deeper slide below 1.17. Of course the euro's outlook could change if the Federal Reserve disappoints sending the dollar lower but if the rate decision turns out to be a nonevent, the single currency could extend its losses ahead of the ECB meeting. The latest economic reports show investors more optimistic on Germany and less optimistic about the Eurozone. Revisions to German CPI and Eurozone industrial production numbers are due for release tomorrow but these reports are not expected to have a significant impact on the currency. Sterling continues to be driven by the market's focus on Brexit as traders completely shrugged off the stronger inflation report. Consumer prices grew 0.3% in the month of November, driving the year over year rate up to 3.1% from 3%. As one of the most important drivers of monetary policy, the UK CPI report should have had a more lasting impact on the pound. Sterling shot higher right after the data but u-turned just as quickly. Brexit negotiations are the problem as they are going nowhere fast - this morning, UK Trade Secretary Fox said he wanted a trade agreement virtually identical to the one they have now. The EU on the other hand wants a deal similar to Canada's where they trade without any tariffs except in farming. Canada also does not have to pay into the EU budget or oblige by their four freedoms but negotiators fear that it would not provide UK companies with the same access to EU markets. These disagreements have led EU's Barnier to say he cannot see a full EU-UK trade agreement by the time Britain leaves in March 2019 - given how much time they have, this is a very grim view. While the Canadian dollar also fell victim to U.S. dollar strength, the Australian and New Zealand dollars extended their gains. The reversal in oil prices and pullback in Canadian yields pushed the Canadian dollar to its lowest level in more than a week. Although USD/CAD is within striking distance of its 5 month high of 1.2817, there's a lot of resistance between that level and the 100-day SMA near 1.2950. Weaker than expected Australian business confidence had no lasting impact on the A$ which continued to march higher alongside NZD$, driven largely by short-covering.